As soon as I found out that I had the opportunity to undertake an elective placement in the UK or overseas I knew instantly that I wanted to go to an African country. After talking with other student nurses the number of people planning to go grew and soon became a grand 12 people, a mixture of paediatric, mental health and adult student nurses. Due to the hectic and immense workload of 2nd year student nursing, we knew that planning and organising this trip would be stressful and time consuming, especially organising placements and accommodation that could take us all, and began feeling that this trip would never happen. That was until we came across work the world, and after much deliberation and conversations with the team, Ghana was our chose destination. 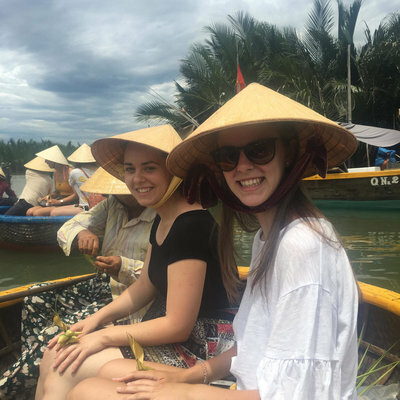 Not only did WTW organise our placement and accommodation, but also gave us valuable information, support and quite often reminders on parts of the trip which we had to sort out such as insurance, visas, vaccinations and essential items should take with us. Upon arriving in Accra, I was initially overwhelmed by how hectic and fast-paced the airport was, and how hot the climate was considering we arrived so late. We were met by Prince and Al-Hassan with the friendliest of welcomes, making us all feel as ease. We were then taken to a nearby hotel in Accra for our first night in Ghana, where we experienced our first Ghanaian dish; chicken and Jollof rice – yummy!! We had an early start the following morning, for a comfortable 4 hour coach ride to the work the world house in Takoradi, a place which we would all call home for the next few weeks and where we would meet our ‘Work the World Family’. When we arrived in Takoradi we experienced Ghana’s ever changing weather, one minute it was sunny and the next minute we were soaked by torrential rain – you would think coming from the UK we would be prepared for this but took us completely by surprise. But as quickly as it started raining, it had stopped. When we arrived at the house, we were greeted and shown around the house by Ophelia (the house cook) and Al-Hassan. Breakfast and dinner is cooked by Ophelia which is incredible!! There is something for everyone, whether you are vegetarian or the pickiest of eaters she will cater for you. My personal favourite was the ground nut soup with rice balls. BBQ nights are every Thursday night, which is a great opportunity to let your hair down and dance foolishly to some memorable music, there’s no doubt that everyone will have fun! Dance-offs, African drummers and dancers, and endless amounts of laughter and giggles is what it is all about. Ever Tuesday evenings we had Fante lessons, taught at the house with groups split in 2 (the beginners and the more advanced) depending on how many lessons you have had. We were taught general words and terms that we would experience within placement and around the town. Staff at the hospital would check on your progress and ask questions in Fante to see how much you had learnt. A great advantage of being in the house with other students is that they are an endless fountain of knowledge; allowing you to share your concerns, stories and questions 24/7. There is a great mix of disciplines; midwives, nurses, dentists, medics and physios meaning that someone has always got an interesting story to tell about what they have experienced on placement. If you have a particularly hard day at the hospital you are able to talk about your experiences with others which can help a lot. They can also help with knowing which places to and not to go on weekends. On our first Monday we were all taken into Takoradi by Prince, for a town orientation. We were shown around and had the opportunity to exchange money and buy sim cards and local mobiles. We were also shown how to get to these places if we needed to at a later date. It was pointed out where the nearest internet cafés, supermarket and local beaches were and also material shops to get material for African dresses/clothes to be made. Prince tells you everything you need to know and informs you know how much you should pay for things – within no time at all you become an exceptional haggler. We were all then taken and shown around the hospital where we would be doing our placement. We were all introduced to the staff, with special effort made with departmental introductions so we quickly felt at ease. My first 2 weeks were spent on a paediatric ward which I was apprehensive about starting as I had no idea what to expect regarding treatments or the illnesses that I would see, but as soon as I had arrived the staff especially the doctors were friendly and I soon felt comfortable. You have to be proactive and show initiative within the ward, if you stand around waiting to be asked to do things or be shown something you may often be waiting there for a long time. The more questions you ask and the more interest you convey the more willing the staff are to teach and show you things. One of the most important things to remember is not to judge and be open minded as the nursing roles, procedures and how treatments are done can be quiet different to the UK. 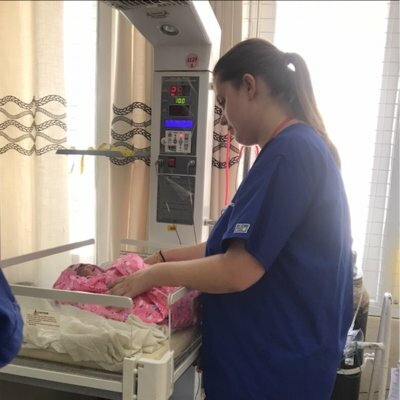 During my 2 weeks on paediatrics I saw a lot of illnesses that I wouldn’t have seen in the UK such as malaria, schitamasosis and typhoid, and these experiences will stay with me forever. The doctor is keen to teach you about these diseases and by the end of your time on the ward gives you the patient’s symptoms and asks what you think this illness may be and how it would be treated. 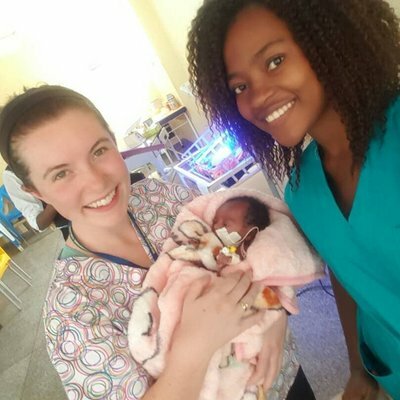 Due to the differing roles of doctors and nurses within Ghana, I found it useful to go on the ward rounds with the doctors, who are the main individuals who facilitate your learning and get you involved in things you wouldn’t see in the UK. My last 2 weeks were spent on the labour/delivery ward and that was an eye opener! If you have the opportunity to go down to theatre to watch a c-section or operation following birth, do so, it’s incredibly fascinating. A visit to the hospital mortuary was certainly an experience, and some advice would be to be prepared to be shocked, it is like nothing I have seen before and I don’t think anything could have prepared me for what I was about to see, words cannot describe it. There are many items that can be suggested to take over; with the most important being alcohol hand gel and aprons as there are none within the hospital. Scissors and pens are also useful as there are not many on the ward, and if you are lucky to find one chances are the pen doesn’t work and the scissors are blunt. I did a lot of travelling whilst in Ghana, with most places being easy to get to – there was never a dull moment. Located in the work the world house is a book where previous students have written places which are good to visit; how to get there; prices etc. One of my favourite weekends was Kakum National Park, where we were able to climb the forest canopy through a series of canopy walkways – that was such an unforgettable experience. Other places we travelled to included Cape Coast, Cape 3 points, Cape Coast Slave Castle, Green Turtle Lodge and Mole National Park. Green turtle lodge is probably my favourite for a relaxing weekend, having sleeping huts on the beach front was amazing. The huts themselves were simple but wonderfully decorated, and had plenty of room for 5 of us to sleep comfortably. The place itself has no electricity meaning no lighting after the sun goes down (which happened at 5pm for us.) This meant dinner by candle/head lamp light – which we all enjoyed and added to our experiences. For a group of city ‘never even been camping’ girls to see (and smell) self composting toilets made everyone around us including the locals laugh at our rather loud and dramatic reaction. For things to do before or after placement there’s shopping in market circle (the sights and smells you experience are unforgettable – some you wish you could!) Africa beach hotel (lovely swimming pool to chill out after a day at placement) the internet café and Harbour View. We were also grateful for the opportunity to visit a local children’s orphanage (Prince organised this for us), which was so rewarding. We had brought over many suitcases full of toys and clothes to give to the children locally as well as those within the orphanage – all of which were extremely grateful to what we could give them. When walking or travelling around anywhere you will actually feel like a celebrity with everyone wanting to talk at you, shouting ‘obruni’ and waving frantically. Overall I loved my trip away and could literally talk forever about Ghana and will jump at the chance with anyone who asks me about it. I felt perfectly safe and never faced any problems whilst over there. Everyone I met was friendly and welcoming and I recommend Ghana and Work the World to anyone. This trip was the best thing I have ever done!